History in Houses. Lincoln Park, One Building at a Time. Discovering the history of La Alma/Lincoln Park has been a bit more of a challenge than with Denver’s other neighborhoods. It’s identity has almost always been connected to people that work, or didn’t work. There were no mansions built by titans of commerce here. There are not many books written about it, or even that reference Lincoln Park. In earlier posts, I have discussed how A C Hunt, our 4th Territorial Governor once lived in a nice house on the land where Lincoln Park is , and owned a good portion of surrounding land. Arriving in 1859 he was an influential man among our city’s founding fathers, was instrumental in bringing the Denver & Rio Grande RR here, but left for Texas to build the Mexican Central RR by 1886. His departure was likely accelerated by the flood he witnessed in 1869, which proved John Evan’s lots up on the hill was the better investment. When Hunt was unable to get the Capital built on his side of the creek, I think he decided to cut his losses and stake his fortunes on the railroad business. The land was sold, divided and homes were built. Denver’s extraordinary growth explosion really happened so fast following the end of the Civil War. The railroads brought seekers of fresh starts and fortunes. The West beckoned searchers of gold and adventure. The city’s leading citizens worked hard to attract the newcomers to aid in building their own empires. The reality I found, is that homes built in La Alma/Lincoln Park did not long pre-date those in neighborhoods much further from downtown. From my read of Denver history so far, the horse-drawn railcars, introduced in 1871, first allowed people to live further from the fifth and muck of the city. In the early years, the riverbank of the Platte was referred to as “the bottoms,” as the place for those with no other place to go. Iron smelters, trains, and other industries near downtown, mostly along the Platte and the Cherry Creek, filled the air with black smoke. Wild dogs, cats and pigs roamed and soiled the streets. In addition, the numerous saloons and brothels in town attracted the roughest of frontiersmen and women. Downtown was a dirty place, and anyone with the means to live a bit removed from it, certainly would, and apparently did. Though Denver’s finest declined to reside in Lincoln Park, they found it useful to their booming metropolis. The jailhouse stood a safe distance across creek, and downstream a bit was the city dump. Further still, Denver General first began as a poor house, as a place to care for the indigent. Later, the city’s first affordable housing project would be built here, too. In learning when, what and who was here, I find it interesting to see the trend toward suburbanization began so early in Denver’s history. I have always connected urban flight to the burbs and the WWII postwar boom and the creation of the interstate highway system. But, for Denver, the public transportation network was actually a key factor in stimulating the growth of the city and the entire region from the start. And so, given the context from which Lincoln Park emerged, learning more about our neighborhoods’s past will require exploring the lives of the average, working class individuals that once inhabited these homes. After Governor Hunt left, there were only teachers, carpenters, clerks, mechanics, and shopkeepers to built the homes we live in today. Each house has a history, and I hope to discover a little bit about each one in due time. In the end, I imagine we will find a vibrant community filled with interesting characters, and a proud history with many chapters to contribute to the Denver story. Of course, I begin this endeavor with a particular house on Kalamath Street, so look forward to meeting Walter Wilson in my next post. 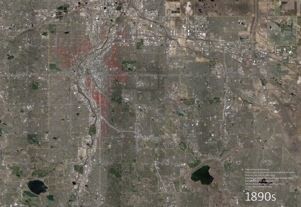 To see a great illustration of the city’s growth click this Link to DenverUrbanism.com. The post even includes an animated illustration to show the progression. To link directly to the gif clickHERE. Thanks for the effort from this loyal reader of Denver Urbanism and her older sister DenverInfill.com, because in overlaying property record data over a map of the city by decade, we can see that yes, growth from the initial settlement started with Highlands, Curtis Park and Lincoln Park. But, if you look at the the decades prior to 1900, there were many homes built out east in Park Hill, Mayfair and Hilltop as well as to the south in the Platte Park and Washington Park neighborhoods.